It's a good thing General Electric Co. builds locomotives -- because this stock is a train wreck right now. It's a good thing General Electric Co. (GE - Get Report) builds locomotives, because this stock is a train wreck right now. GE started the week with the announcement that it was laying off 12,000 employees in its Power Systems division, a move that many on Wall Street are interpreting as a failure of the firm's $10 billion Alstom Power acquisition in 2015. Shares of GE plunged early in Monday's trading session before stabilizing and hovering back around Friday's close. It's not that the prospect of layoffs was so terrible for GE, even if it meant that the company misjudged its GE Power investment -- GE clearly needed to do something to fix operational issues that caused one of the bluest blue chips to slash at its dividend payout this year. Instead, the layoffs are just the latest excuse to sell a stock that's been a blight on most investors' portfolios all year long. And it won't be the last. At a glance, it's not hard to miss the long-term price trajectory in shares of GE. 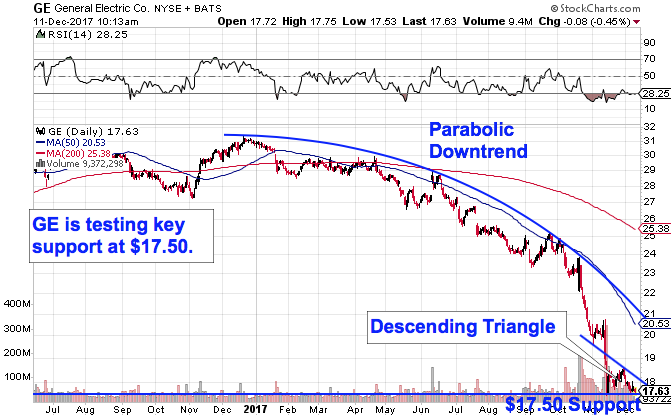 This stock essentially kicked off 2017 with a parabolic downtrend that's practically cut this stock's market capitalization in half year-to-date. That's some very conspicuous value destruction in a market environment where nearly everything else is moving up and to the right. And now, GE is testing a critical price floor at $17.50 as shares show off a bearish continuation pattern in the near term. GE is currently forming a descending triangle pattern, a continuation setup that's formed by horizontal support down at the aforementioned $17.50 level, with downtrending resistance to the topside. Simply put, as this stock has pinballed in between those two price levels, shares have been getting squeezed closer and closer to a breakdown through $17.50. If and when that breakdown happens, we've got a brand new sell signal in GE. For now, support at $17.50 is holding up, but only just. Stepping away from price-chart patterns for a second, the real driver of the down move in GE, if $17.50 gets violated, is the fact that the glut of demand for shares that has reversed selling on previous tests of that $17.50 level isn't infinite. A material break through $17.50 is the signal that increasingly zealous sellers have absorbed that demand with their supply of shares, making more downside a high-probability move. The bottom line: If GE can't hold $17.50, you don't want to hold onto it either.